If you’ve read my Fame Academy post then you’ll know what I am going on about here. If not go and read it! Many people have asked me about the presenters microphones, shiny and bling they say. Well in recent years like so many other things Radio microphones have turned in to a fashion statement, the alta ego of the person using them if you like. I remember when I was at the Brit Awards in 2001 and Eminem performed using his platinum Sennheiser radio microphone reputed to have cost over £20,000 (~$40000) each (he had a spare as well!). His monitor engineer summed it up when I asked wasn’t that over the top, he said “Platinum mics for a Platinum artist”. Since then most productions spec chrome finished microphones for their stars. 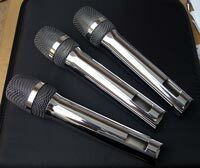 Last summer we had gold and silver plated microphones produced for the Robbie Williams tour. Kylie Minogue had crystal encrusted microphones commissioned for her tour, followed by Sennheiser commissioning something similar for the Brit Awards 2007. Fame Academy was no different they needed 2 for presenters and a live spare, so 3 hand held microphones in chrome. 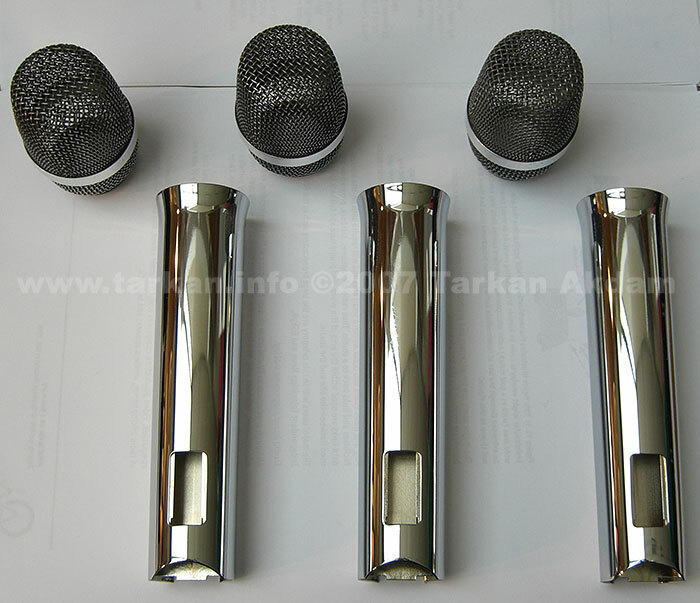 The microphones used were Sennheiser SKM5200, so we sent the empty bodies to a chroming company who stripped the old finish before plating and polishing to a nice chrome finish. We supplied standard microphones for rehearsals. And this is what we got back. click on images for larger versions. I was intending to show you the final assembled microphone, but due to delays I had to rush down to County Hall and swap the bodies over onsite. So one train and cab ride later I walked on site to find that they had started rehearsals and I had to perform the body swap in virtual darkness with flashing lights with lots of singing going on! great! To make matters worse I had to work on the spare microphone while the others were being used and swap them when done. So I did this for all 3 microphones without losing any screws and pardon the expression screwing it all up! Here are some screen captures from the TV showing the microphones in action. Excellent shot of great mic technique from the guy on the left!